The Alinco DR-638T dual-band VHF/UHF commercial transceiver offers full duplex capability, cross-band repeat and a remotely mountable control head, the DR-638 is a solid performer for base or mobile operation. Transmit coverage is 136-174 and 400-480 MHz. Receive ranges are: 108-180 MHz (AM/FM modes), 220-260, 400-532 and 350-400 MHz FM mode. With a highly visible large, 6 character alphanumeric display features variable display colors for custom illumination. Multiple power levels are available. VHF 50, 25, 10, 5 watts and UHF 40, 25, 10, 5 watts. 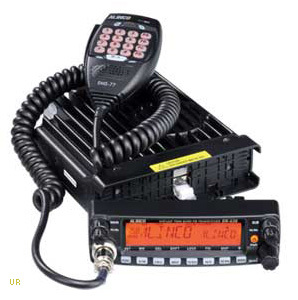 Features include: 758 channels, 6 character alphanumeric backbit display, internal duplexer for single antenna operation, removable control head expanded receive range including AM VHF air band, Cross-band repeat, illuminated DTMF EMS-77 microphone with direct frequency entry and remote control, CTCSS, DCS, Tone-Burst Tones, 2-tone and 5-tone signaling and CTCSS Tone and DCS scan. The supplied EMS-77 backlit, DTMF microphone allows remote control of the transceiver. Also comes with ADFM78 mounting bracket, spare fuse, mic hanger, manual and DC power cord.